Special Adviser to the Governor on Primary Health Care, Dr. Olufemi Onanuga immunizing a child against polio at a Flag-Off Ceremony to signal commencement of second round 2018 National Immunization Plus Days at Agege weekend. The Lagos State Government has said it will immunise 4.8 million children aged zero to 59 months in the second round of 2018 National Immunization Plus Days (NIPDs), polio vaccination campaign which commenced on Saturday. 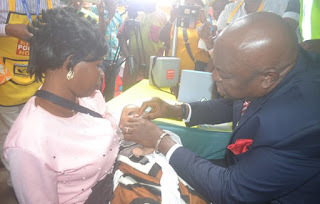 Announcing this was Dr. Olufemi Onanuga, Special Adviser to the Governor on Primary Health Care, who said the vaccination which would end Tuesday, is taking place at all designated sites in the State. Onanuga also assured on the level of preparedness for the campaign at a flag-off ceremony to signal the commencement of the campaign at Agege Local Government Secretariat. 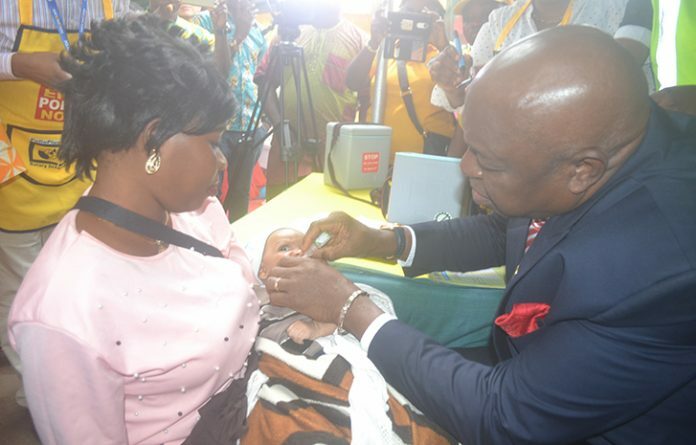 He further observed that the goal of the State government is to increase the number of children between zero and 59 months who receive two drops of oral polio vaccine irrespective of their previous immunization status. The Special Adviser viewed that this will boost children’s immunity against poliomyelitis.